On February 12th 2014 , Narendra Modi launched an interesting digital on-ground activations in the history of Indian Digital Ecosystem with a tweet. 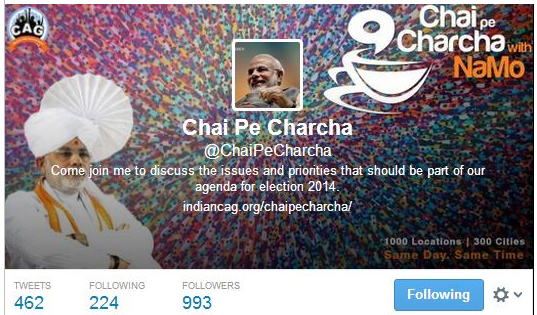 I am looking forward to #ChaiPeCharcha this evening. It will be wonderful to interact with sisters & brothers from across India. Chai Pe Charcha is a mega outreach programme for BJP’s Prime Ministerial Candidate Narendra Modi, conceptualized and executed by Indian Citizens for Accountable Governance (CAG). A unique platform devised to discuss and highlight local issues with senior leaders from BJP and Narendra Modi over a cup of tea, this indeed is a revolutionary step towards direct and participative democracy. The theme for the first edition of Chai Pe Charcha was Good Governance. The big idea for this innovative and resilient campaign stemmed from the controversial remark made by Congress Leader Mr. Mani Shankar Aiyar, “I promise you in 21st Century Narendra Modi will never become the Prime Minister of the country. But if he wants to distribute tea here, we will find a place for him.” As a part of the campaign, Modi will interact with people in tea stalls through video conferencing, covering 300 cities and 1000 different locations across the country. Reach out to the masses offline as well as online and engage in a personal real time conversation over issues which are relevant to them. Crowd source views, suggestions and content on issues from netizens, which can be used in devising personalized election manifestos. 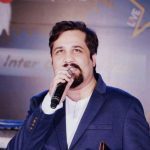 Convert the online buzz and engagement into a tangible community of brand advocates who would propel positivism through word of mouth for Narendra Modi and BJP prior to the General Elections due in May. Citizens for Accountable Governance started the Facebook Page for Chai Pe Charcha on January 21st i.e three days after Mani Shankar Aiyar’s remark. The Twitter handle for the campaign was subsequently launched on 30th January. As a prequel to the campaign and to create the initial buzz, video bytes from various tea vendors across the country were posted on the Youtube channel for CAG. 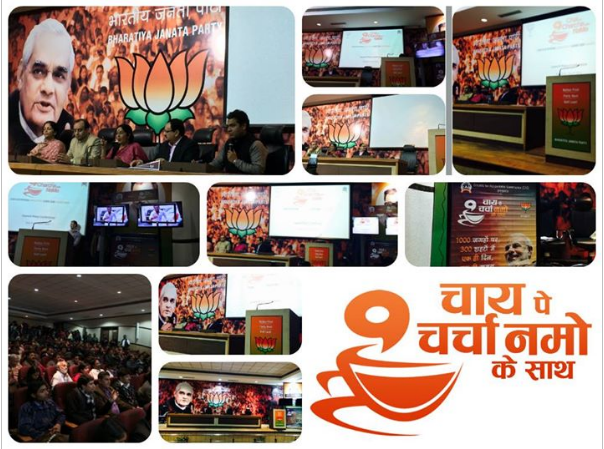 On February 4th , 2014 Chai pe Charcha was officially launched by Smt. Sushma Swaraj in Delhi with an official video in a press conference. Addressing a press conference at the Bharatiya Janata Party (BJP) headquarters, Sushma Swaraj said the party’s prime ministerial candidate, Narendra Modi, would launch the campaign nationwide on February 12. The video went viral within a short span of time with over 20,000 views in one day, people really liked the music and the lyrics of the Chai pe Charcha song. Cashing in on the popularity, the song was available for download as a ringtone the next day itself. On the 6th of Feb 2014 , the microsite for Chai Pe Charcha was hosted on the sub domain of Indian CAG’s website with web based apps on the website as well as on the Facebook page. The web based apps which were also hosted on the Facebook page offered three features i.e Share , Ask and Suggest. Share the content of Good Governance in your online and offline networks , ask your questions regarding Good Governance to Narendra Modi and Suggest solutions for Good Governance , stand a chance to win an opportunity for interacting with Narendra Modi via video conferencing. The Campaign integrated a mix of digital technologies (DTH, Satellite, Campaign Microsite, Mobile, Whatsapp, Youtube, Twitter and Facebook) to ensure maximum reach and participation. On the website visitors could locate the nearest tea stall where Chai Pe Charcha was being broadcast, attend the Chai Pe Charcha discussion live at a tea stall, online/DTH and connect with the updates on city based NaMo Pages with the click of a button. Individuals could also share, ask for content by sending SMS or Whatsapp to a designated number 0 78 78 78 2014 for the campaign. 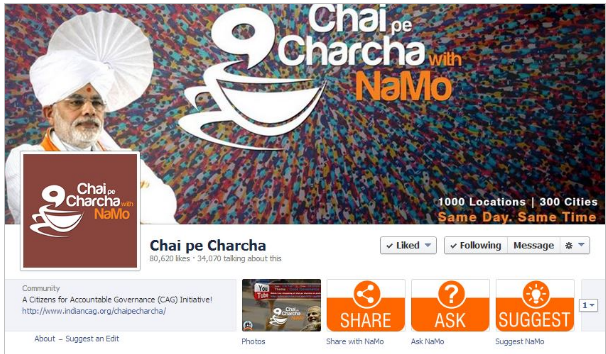 Alternatively #ChaiPeCharcha could be used to interact with Narendra Modi via Facebook and Twitter. The event was streamed live on the YouTube channel for about three hours and the same was telecast on Videcon D2H Channel for television viewers. The seamless integration of digital technologies with a strong offline connect and live discussions on issues relevant to the target audiences over a cup of tea was absolutely flawless in terms of reach and participation. The perfect blend of tea and technology made it one of India’s biggest digital on-ground activation in recent times. The concept for Chai Pe Charcha was phenomenal and path breaking as it served as a catalyst to expand Modi’s reach to the masses both online as well as offline. The stage was set for him to express his views and opinions over issues raised by the general public, thus strengthening his connect with the masses which might help him score BIG in the upcoming General Assembly elections. In terms of digital strategy, the timing for the campaign was spot on. Brand Modi has reached a stage wherein he has over 1 Crore followers on Facebook, 33 Lakhs on Twitter, making him the most mentioned politician on social media in India today and this is the ideal time for him to engage with the masses and convert them into brand advocates and loyalists. The campaign in itself was impeccable and quite successful in leveraging on the humble origins of Narendra Modi , the controversial remark and his huge fan following across various online mediums. The conceptualization and execution of the campaign was brilliant, but the #ChaiPeCharcha failed to trend on Twitter despite the 35 thousand tweets in 24 hours- which is surprisingly strange and shocking. Although it was a trending topic on Facebook the campaign could have had a larger impact if it would have trended on Twitter as well, in India. While the campaign tried to converge an array of digital technologies, some social media channels like Google+, Instagram , Pinterest were ignored despite their user base being 14 million , 4 million and 5.5 million respectively. An integration of the campaign with these social media networks could have added huge numbers to reach and participation. Moreover, the campaign could have traversed from tier 2, tier 3 cities to rural India since the idea was to reach out to maximum number of people and as they say fortune lies at the bottom of the pyramid. Touching upon the lives of rural folks would have been the icing on the cake so well baked already. Chai Pe Charcha is by far one of the largest digital on-ground activation India has seen. In the past we have seen brands utilizing a mix of social networks and offline events to fulfill their marketing objectives but the scale of this campaign was unprecedented and exceptional. Citizens for Accountable Governance have done a fantabulous job in conceptualizing and executing a simple idea with a creative and innovative approach resulting in profound reach and participation. 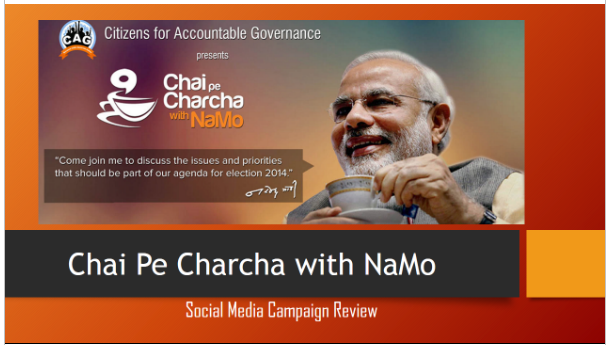 Overall, Chai Pe Charcha has managed to meet the objectives of engaging with the masses, crowdsourcing views and suggestions and most importantly, it has added a considerable number of people to the pool of brand advocates and brand loyalists for Shri Narendra Modi. Twitter character limit expanded to 280, brands are loving it!